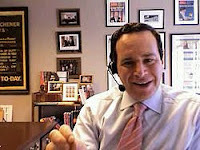 So what does David Frum, a neocon who lets terrorists like the American Enterprise Institute and Bill Kristol (who once left a message for me on my dad's answering machine when I was writing a newspaper article about him) help edit his book, have to say about the cultural significance of a decade? Other than a wonky title (How We Got Here: The 70s: The Decade That Brought You Modern Life -- For Better or Worse), the former economic speechwriter for George W. Bush finds that, no matter how good Americans have it, they still feel "less content, less secure, less proud of their country than they did 40 years ago, when Jim Crow still ruled the South, Soviet bombers were aimed at Manhattan, a heart attack meant certain death, and $20,000 a year was a handsome wage." In 1972, Senator Edwin Muskie destroyed his hopes by crying on the stump after an editorial attack against his wife. "Today, those tears would float Muskie into the White House." He claims that the typical American male has mutated from what Tom Hanks looked like as a soldier in Saving Private Ryan to what that movie's director, Steven Spielberg, looks like in his wimpy t-shirt and ball cap. And this is a bad thing? I suppose Frum wishes about 100 percent of us could be off at war right now "manning up." Frum says this "mutation" really happened in the 1970s. Despite public perceptions of the era, most people in the late 1960s had short hair and were not promiscuous. This happened in the 70s: "a time of unease and despair. The murder of athletes at the 1972 Olympic games. Desert emirates cutting off America's oil. Military humiliation in Indochina. Criminals taking control of America's streets. Marriages collapsing. Drugs for sale in every high school ..."
This created, Frum uncontroversially argues, "the most total social transformation the United States has lived through since the coming of industrialism." The country became "more dynamic, more competitive, more tolerant; less deferential, less self-confident, less united; more socially equal, less economically equal; more expressive, more risk-averse, more sexual; less literate, less polite, less reticent." Frum starts digging into the details of his thesis by examining the shift from when, in 1958, "57 percent of Americans trusted the government in Washington to do the 'right thing' most of the time." Indeed, how far we've come. All the way to teabagging for change. These shifts are surely interesting areas to examine, but I'm guessing from the slow start to this snoozer that Frum and his crew are not the right people to shed any intellectual light. Oh, how I miss my smart Georgetown political science professors.